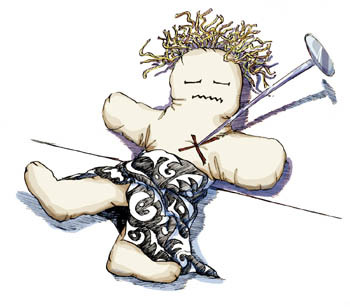 Will I be a happy voodoo doll on Sunday? And I pay Rs 750 + VAT = Rs 862.50 monthly. Same: And I will still have to pay Rs 862.50 monthly if I don’t decide to keep the 15 international channels after the three months. For example, it is written “La vitesse double sur les offres My.T existantes […] aux mêmes tarifs.” This is why I wrote above that I’ll indulge in 512kbit/s while still paying Rs 862.50 monthly. 15 international channels? Which ones? Don’t mention channels like Doordarshan Sports or NDTV Good Times. They are crap! I suspect a mix of 1-2 relatively good channels (e.g. CNN and, ahem, B4U Music) and a bunch of pathetic ones. 15 international channels? Yes. But at what quality? Watching VOD programs sometimes is excruiating as the image is so bad (compression artefacts everywhere for instance.) I don’t even want to talk about sound quality because it pains me to do so as a musician. I cannot see Mauritius Telecom sending 15 TV channels over IP without making extreme concessions in quality. Will this be worth Rs 135 per month? Time will tell. The infamous fair usage policy! Mauritius Telecom has still not explained what the limits exactly are. With increased bandwidth, people will indulge in more video (e.g. YouTube) as well as more streaming radio. I know I will. And if you think about it, this is the whole point of having increased bandwidth. Obviously, my daily download volume will increase. Will the FUP be modified to take this behavioural change into account? I doubt it. And finally what guarantee do we have that we will actually be able to use a substantial part of the promissed bandwidth? None! Mauritius Telecom, like all ISPs, sells dreams and does its best effort but routinely fails. For instance, Internet was slow both at home and at work today… We cannot protest because, well, they can prove that they are doing their best effort even though this does not mean anything concrete. Now, with mostly everyone doubling their maximum bandwidth (I don’t see a lot of people downgrading), how can that possibly work without Mauritius Telecom doubling its international bandwidth? As far as I know, this has not been the case and I doubt that this will happen in the next two days. What I can sense though is a lot of frustration on Sunday. Mais bon, donnons leur le bénéfice du doute. Let’s see what happens on 1 March 2009! I just hope we are not just voodoo dolls for them which they manipulate as they like. 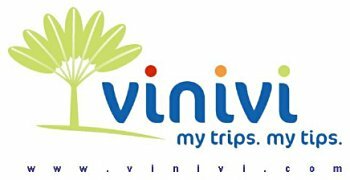 Vinivi est l’un des sites leader Européen sur le voyage et l’une des rares Start-Up 100% à Maurice. Nous travaillons 100% de notre temps sur le site et sommes en partenariat, par exemple, avec de petites sociétés comme Google et Galiléo. Une équipe soudée, moyenne d’âge équipe de dev : 26 ans, beaucoup de projets et pas assez de temps pour tout faire. Vinivi est un site participatif (web 2), il faut donc être geek, savoir ce qu’est Internet et une API. Les jobs, plein temps, sont situés dans nos locaux à Trou Aux Biches, dans le Nord. 2-3 years of related professional experience. There are places remaining for Linux Level 2. Don’t hesitate to contact me if you are interested. But be quick as everything must be finalised by the end of the week.